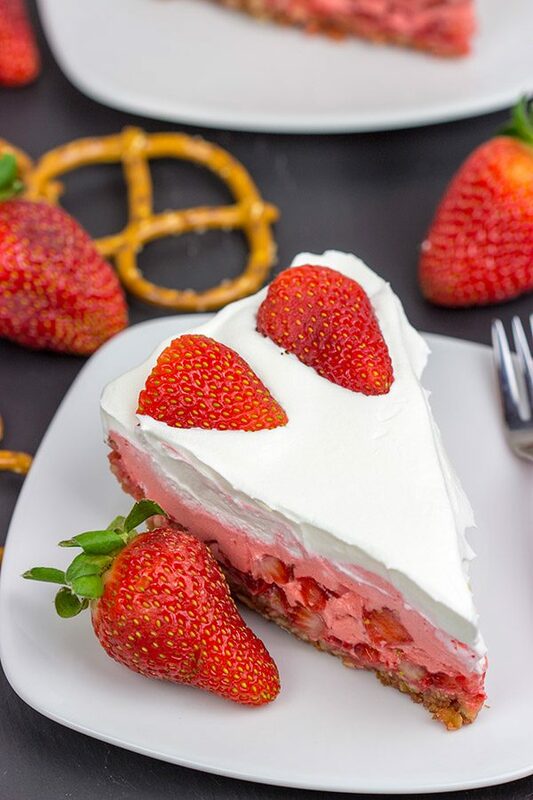 This Strawberry Pretzel Pie is a throwback to a classic recipe…but with a twist! It’s also an excellent dessert to serve at a summer picnic! A couple of weekends ago, several of our friends decided to get together and recreate “classic” recipes. By classic, I mean old. Like dust off Mom’s and Grandma’s recipes kinda old. 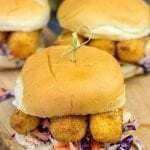 Food trends definitely evolve over time, and it was fun to go back and rethink an old favorite. On a side note, it’s funny how recipe trends totally circle back around. For instance, meatballs with grape jelly, bundt cakes and fondue helped define the food scene of the 1960’s…and each of those have once again become popular. Ok, maybe not so much fondue…but I’m trying to mentally justify the fact that we own a fondue pot. Hey, fondue is awesome…let’s make it popular again! Today’s Strawberry Pretzel Pie is a throwback to the days of desserts that featured fruit suspended in gelatin. My grandma used to make a cranberry orange gelatin dessert every year for Thanksgiving. I don’t think I ever ate any of it. 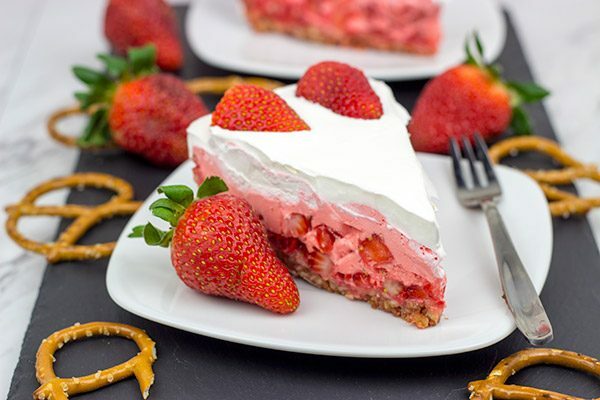 But this Strawberry Pretzel Pie? I could’ve eaten all of it. Well, I did share it with Laura and our friends, but I would’ve eaten all of it by myself if they weren’t here! I also introduced whipped topping into this pie as a further twist. For me, the sight of fruit suspended in jello just isn’t the most appetizing idea. But mix in some whipped topping, and you’ve got a fun new idea! Plus, doesn’t it look pretty cool when you divide it into 2 layers? We’ve been eating fresh strawberries like it’s our job lately, and I seriously had to hide these strawberries in the back of the fridge. Robbie has gotten smart, and he totally knows to peek in the fridge whenever we open it. If he’d seen these strawberries sitting there, then the game would be over. And I would’ve been heading back to the store for more strawberries. If you’re looking for a fun, chilled dessert to serve on a hot summer day, then look no further! 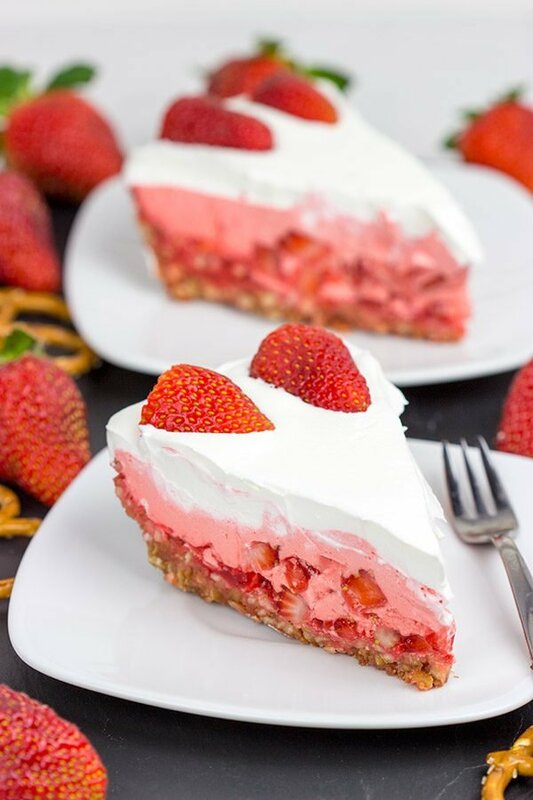 This Strawberry Pretzel Pie is an easy dessert, and it’s sure to get lots of comments from friends and family. Enjoy! Using a blender or food processor, crush pretzels until finely crushed. Transfer pretzels into a medium bowl and stir in brown sugar and melted butter. Using a medium mixing bowl, stir gelatin and boiling water together until fully dissolved. Let sit for 2 minutes. Stir half of whipped topping and all of the diced strawberries into gelatin. Spread this mixture evenly into the pie crust. Spread remaining (i.e. plain) whipped topping on top of the strawberry layer. Garnish with additional sliced strawberries before serving. Dude – you make a good point – yesteryear foods (like fashion) are making a comeback – btw, speaking of fondue – did you and Laura visit the melting pot when y’all lived down here and feasted on their 3 course fondue? 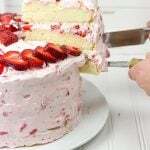 Btw – yes, that whipped topping layer definitely makes this treat look pretty cool – I am a huge fan of sweet and salty desserts too and seeing I popped on here just as you shared this, I just might have to send my drone up – it’ll join Robbie and wait for y’all to open your refrigerator only to sneak in and steal a slice of this – P.S. I’ll make sure it leaves ALL the strawberries for Robbie! Happy Monday to all of y’all! Yes, I agree that fondue is making a comeback! It’s a fun one. We did indeed visit The Melting Pot, and they actually have a location up here. (Sadly it wasn’t very good. Great concept, just poor service.) I’d much rather make fondue here at home! So if you send your drone up for a slice, but you leave all of the strawberries for Robbie…then you just end up with a pretzel pie. Not that it’s a bad thing, but you might need to smuggle out a couple strawberries! Haha! Thanks, Shashi! Let’s totally bring fondue back! I, too, own a fondue pot–it’s really just an excuse for me to eat more cheese. (As if I actually need an excuse. . .) But while we’re bringing things back can we just leave aspic in the past? 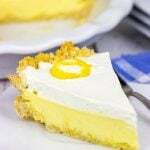 I’m all for gelatin in desserts and this pie looks DELICIOUS, especially with the pretzel crust. But the thought of meat suspended in jell-o makes my stomach turn. Of course you own a fondue pot, Kelsie! I’m convinced you’re my west coast doppelganger. 🙂 I mean melty cheese is almost impossible to beat! So I wasn’t familiar with aspic, and I googled it. Uh, gross. Who’s idea was that!? Aspic can most definitely stay in the past! We’ll just stick with the berries in gelatin instead. I totally still love fondue. I don’t think it’s gone out of style! 🙂 I’ve never had a dessert quite like this before. I’m trying to image the pretzels in here. I love the sweet salty thing going on. My grandma used to make a dessert with cutup jello and whipped cream mixed together. We all thought she was the best cook ever! I agree with you, Kathy! Fondue really is fun. In fact, our first meal in our first house was fondue. I totally set up that fondue pot on a card table and we used upside-down boxes to hold our plates. Haha! So I’ve gotta say that you should try this pretzel pie. It’s a fun throwback since it uses jello and whipped cream, but the pretzel crust brings this one forward about 50 years. At least in my opinion! Either way, it’s delicious! Hi David! This pie looks lovely! I might be guilty of hoarding if this was in my house. Since I was raised in the 50’s and 60’s I remember some really awful gelatin dishes! And I totally agree with Kelsie that meat and gelatin are just plain wrong! Jason was the same as Robbie, only his fruit fixation was with blueberries (actually it still is). Great summer dessert! Yeah, I can’t even imagine meat in a gelatin dish. I didn’t even know that was a thing until I saw Kelsie’s comment. I love a good steak, but don’t put it in gelatin! Ick! And truth be told, Robbie is more addicted to blueberries than strawberries. He loves ’em both, but we’re heading up to the blueberry farm this Saturday so he can pick/eat his fill! Thanks, Dorothy! David – I love heirloom recipes, you know that. This one is so familiar to me, as my aunt always made a kind of sheetpan dessert that was very similar. We absolutely loved it! I may just have to pull that recipe out and compare. Thanks for reminding me and for this totally yum recipe! Yes, I totally know your love for heirloom desserts, Laura! So what a fun idea to turn this one into sheetpan form. That would certainly make it easier to serve to a crowd. And I’ve gotta say the crushed pretzels in this one are a fun twist! I love sweet + salty desserts. Thanks so much, my friend! 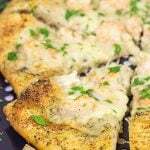 It sounds so fun to have a friend get together where everyone brings classic dishes recreated! I’d love to do that sometime & will have to keep it in mind. 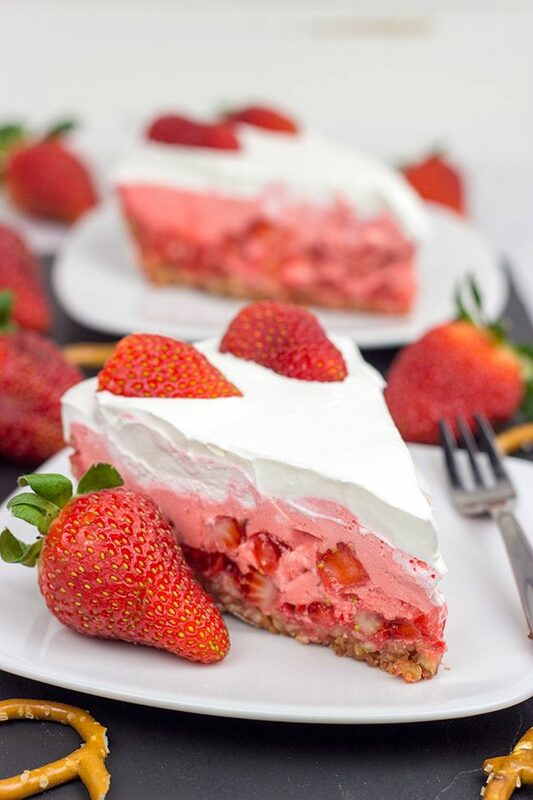 This recipe reminds me of how in the 90s when I was a kid, my mom used to make strawberry jello and eat it with cool whip for dessert all the time! I adore the idea of bringing back classic recipes, I wish I could have been there to see all the creations. Speaking of, have you ever seen the documentary Fannie’s Last Supper? If not, you got to check it out. I’m pretty sure you can see the preview on YouTube. Anyway, gorgeous shots and mouthwatering recipe, David! Sorry I’ve been absent for so long, I’ve been fighting with my city and winning. I’ll probably blog about it soon. Hahaha! I’m totally laughing at the ‘suspend us in gelatin’ comment, Christina. But of course you were never bad, right? 🙂 There are definitely some days that I wouldn’t mind suspending Robbie in gelatin. Hah! So I’m not familiar with Fannie’s Last Supper, but I’ll have to go check it out. Thanks for the recommendation. We’re always looking for new shows for the list! No worries about being AWOL for a bit. It happens. But now I’m curious about the ‘fighting with my city’ thing. We’re fighting with a previous contractor on our end. It never stops, right? Even though I love trying fancy and sophisticated (sometimes weird) things now, it’s so cool to make and eat something that you would / would not eat as a kid! I think it’s kind of an attempt to have connections with your past as long as possible (And as we are getting older, those connections are gradually disappearing). Food memories are the strongest connections, that’s why I’ve been making some desserts from my childhood lately. On the other hand, it’s great to tweak old recipes, and I think you did a great job. I cannot say I would eat a jelly based cake as a kid, but I wouldn’t mind now. Please include my name in your mailing list next time 🙂 Also, wondering if sparkling wine/champagne + strawberry gelatin would work here. I agree that these connections with our past are disappearing, Ben. I know there is a huge push to get out and interview folks from previous generations before it’s too late. It’s fascinating to hear people’s stories from things like World War II and those generations. So different than today. And I agree that food-based memories are some of the best ones, too. This pie is a fun one, and I really like the idea of using wine/champagne in here. Next time I’m doing that! My Grandmother used to make a cranberry-orange gelatin dessert for Thanksgiving too! Only difference is that I always at it. I loved it! Why thank you very much, Valentina! I wouldn’t consider myself a pie expert at all…but I do like making desserts! 🙂 I totally know that orange-cranberry gelatin dessert. Hey, if we’re ever at Thanksgiving together, then you can totally have mine. Haha! Interesting! They have to dress to match the era, too? That would certainly add a wrinkle of difficulty…but it would be fun! So fruit in gelatin is totally ok, but I have to say it’s even better in pie form with a pretzel crust. Of course, I might be a little biased here. Haha! But Kelsie’s comment above about meat in gelatin? Uh, what!? No thanks. Hope your week is off to a great start so far, my friend! I love pretzel crust when making a pie, I love the sweet and salty taste. Love the combination of strawberries with this pretzel crust. Looks so delicious! Anything with pretzels in I love. In fact Lynne knows we can’t have pretzels in the house as I go rummaging around for them and just end up eating the whole bag in one sitting! However, I might be persuaded to keep some back for this delightful strawberry pretzel dessert. Yum! 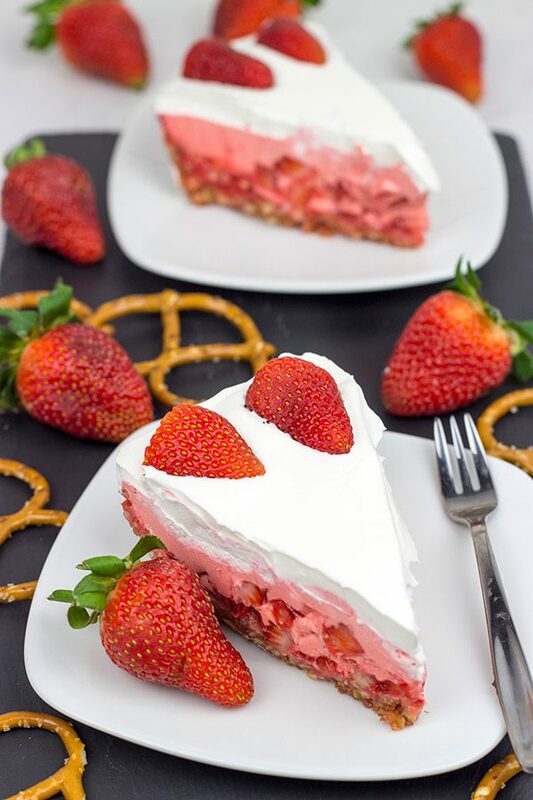 I love re-creating classic recipes, always a blast, this pie sounds amazing, specially with that pretzel crust, we´ve been eating a ton of strawberries in my household too, there just too good!! Hey Albert! So this pretzel crust? Awesome! I love sweet + salty desserts, and this one definitely falls into that category. Plus, it’s a great way to use fresh summer berries. In fact, we’re going blueberry picking this weekend…I wonder if I can make this same pie with blueberries? We’ll see! Thanks so much for stopping by, my friend! It may be an oldie, David, but it’s definitely a goodie! I love desserts that are salty and sweet – this fits the bill perfectly! Some old recipes (like that aspic that Kelsie mentioned above) need to disappear quietly. But others (like this strawberry pretzel pie and fondue) need to become popular again! We were really pleased with how this one turned out. Thanks so much, my friend! I can’t help loving Jell-O and Cool Whip. I’m not sure if it’s because they’re engineered to be chemically irresistible to humans, or if it’s because I grew up eating them, or both. Great-looking pie, David. I agree, Jeff…Cool Whip + Jello must be symbiotic ingredients. They’re good alone, but even better once you combine them. Totally a throwback to the days when we were kids, right?? I love this idea of using pretzels for a base. 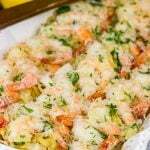 It’s makes a nice change from the sweet bases often used in these dishes. The pretzels add a nice salty touch to this pie…and salty + sweet is one of my favorite dessert combos! Thanks so much, Harriet. I really appreciate you stopping by and commenting! 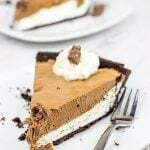 WOW this pie looks gorgeous and so delicious! Perfect for hosting! Thank you so much, Natalie! This pie is a really fun one for sure…and the pretzel crust brings a tasty salty + sweet combo to this dessert. Perfect for summer when you’ve got plenty of fresh berries! Thanks so much for stopping by and commenting!